FOCCUS© Trainers are experienced FOCCUS© Facilitators who become certified to teach others to be FOCCUS© Facilitators and to use the FOCCUS© Pre-Marriage Inventory with couples. If you are a seasoned FOCCUS© Facilitator who has helped at least 10 couples with their marriage preparation, we invite you to attend a FOCCUS© Trainer Workshop. * If you have not met this requirement, we will consider applicants with relevant advanced training and experience. 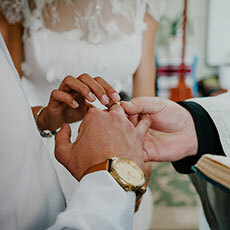 Training also includes information about the REFOCCUS© Marriage Enrichment Inventory, a set of six self-administered marriage enrichment questionnaires suitable for couples who have been married for more than two years. The REFOCCUS© Marriage Enrichment Inventory is a pencil-paper inventory that does not require administration by a trained FOCCUS© Facilitator and can be taken independently by couples at home. REFOCCUS© also can be used by a marriage leader in individual or group work with couples.